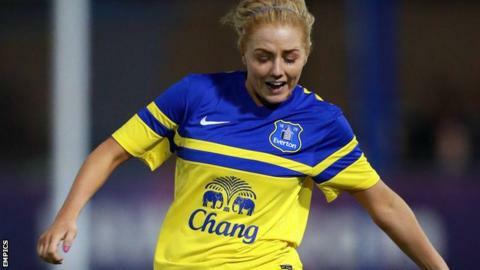 Everton upset Merseyside rivals and reigning Super League champions Liverpool to become the first team to reach the FA Women's Cup semi-finals. First-half goals by striker Nikita Parris and left-back Alex Greenwood gave the Toffees a surprise victory. Manchester City host Chelsea and Notts County visit Portsmouth in the quarter-finals on Sunday. The tie between Birmingham City and Arsenal has been put back a week as City are in Champions League action. Everton enhanced their chances of a third FA Cup success when Parris shot them in front after just 10 minutes. As Liverpool hit back, midfielders Fara Williams and Amanda DaCosta both narrowly missed the target. But Greenwood doubled the lead for Andy Spence's side with a well-struck volley on the half-hour. The Reds pressed hard in the second half to get themselves back into the game. But as frustration set in, former Everton players Williams and full-back Becky Easton both collected yellow cards. Defender Lucy Bronze was also cautioned in the closing stages as Liverpool, for all their pressure, could not find a way through.